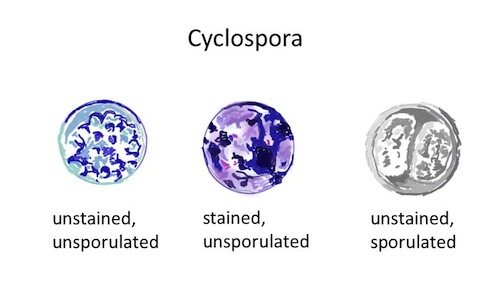 While the Western Pacific region faces up to a Botulism alert, North America is tackling a completely different kind of food borne infection due to the sporozoan parasite Cyclospora. The emerging story is worth a close look as a model food outbreak investigation. The multistate outbreak investigation, biology, epidemiology, clinical features and laboratory confirmation are all available on the Centers for Disease Control website. Particularly helpful to those who want a quick snapshot is the map of confirmed cases. There have been over 400 since two cases of Cyclospora infection were noted in people who had no history of overseas travel. Of these, at least 24 have needed hospital admission. A pre-packaged salad is considered to be the main vehicle of infection, but it is still unclear whether all cases belong to the same multistate outbreak. Both this and the New Zealand Botulism alert illustrate how difficult it is to co-ordinate public health investigations of suspected foodborne infection across state and national boundaries. It is becoming increasingly difficult to quickly follow up epidemiological and public health laboratory leads when the paddock-to-plate food production chain is so complex. It also reminds us that conventional food processing methods leave a few gaps unplugged in industrial food production, in the form of bacterial spores and cyst-forming parasites. Both are suitable strategies for surviving hostile environments.